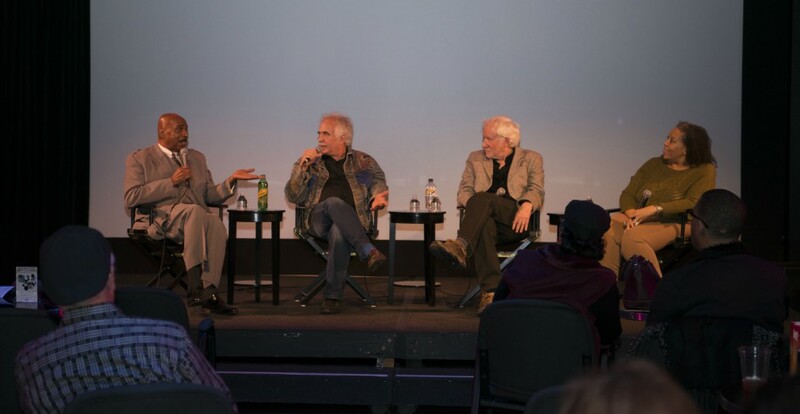 The Gospel Roots of Rock and Soul project held the Philadelphia premiere of a wonderful new documentary on Sunday, February 25th, 2018 at the Prince Theatre, with a screening of a marvelous documentary How They Got Over: Gospel Quartets and the road to Rock & Roll, a film by Robert Clem. The documentary tells the story of African-American quartets who traveled the back roads of the Deep South in the 1930s and 40s creating a hard gospel sound and energetic performing style that foreshadowed doo-wop, R&B, soul and rock. It features performances and interviews with the Dixie Hummingbirds, Blinds Boys of Alabama, Sister Rosetta Tharpe, Soul Stirrers, Fairfield Four, Sensational Nightingales, Sister Rosetta Tharpe, Mighty Clouds of Joy, Highway QCs and more. After the screening there was a panel discussion moderated by Stephanie Renee, a radio host and Program Director from WURD. The panel included Philadelphia gospel radio host and historian Linwood Heath, historian, author and co-producer of the film, Jerry Zolten, and director/producer of the documentary, Robert Clem. Right to left: Linwood Heath, Jerry Zolten, Robert Clem, Stephanie Renee. Stephanie Renee: Do the three of you have working definitions for where the lines are drawn between gospel, rock and soul? Robert Clem (RC): Yeah, let me just say – Otis Clay – one of his interview bits that we didn’t put in the film – he said that down in Mississippi that the radio was so limited that he would listen to whatever was on and often times it was the Grand Ole Opry. He said to me the that it was Hank Williams who was the most soulful person he had ever heard. Jerry Zolten (JZ) : Yeah, I think it was Ray Charles who said that every music has its soul and he was a master at finding it in in country music. I’m going to steal an idea from Pete Seeger actually. Pete Seeger’s father said that trying to stop music in time or put it on paper is like taking a picture of a bird in flight. You’re only getting that one little moment and does that define what it is? I think so. Gospel and Blues – these things have all been malleable and floating around and going through changes. There’s no one thing called gospel. I think that African-American religious music is probably the first purely African-American music there was and I think it’s been serving as a foundation – as a fountain – to all these other secular genres all these centuries, and that’s one of the things that I know we wanted to have come out in the film. LH: And the black quartets were first. Before there was Thomas Dorsey, there were the black quartets for part of the minstrel shows in the 1800s. The first recording of a quartet was the Unique Quartet with the song “Mama’s Black Baby Boy” on the Edison label. JZ: This stuff was going on before the Civil War. Because they didn’t know the rules, they broke the rules, and came up with new rules that changed everything. Mr. Tucker (Ira Tucker of the Dixie Hummingbirds) would talk about how they would stand on the street corner when they were kids and they’d make up chord harmonies, and if they hit on one that was really hot everybody had a job to do to remember their note so that they could recreate it and put it in a song somewhere. LH: And that is how Doo-Wop started. In our neighborhoods one would be in one group one section of the city and one would be on the other kind. We’d have these doo-wop battles. SR: What I think is really interesting about this is that for people who do not have this knowledge, you’ve been able to capture so beautifully in the film about the roots of this music and how it has continued to evolve. Bob, as the filmmaker, what is it like for you to be able to speak to the history and present this in an organic, living way on film? RC: I think that when I was growing up in Alabama. I had no knowledge of Black gospel quartets. I knew that there were white gospel quartets but everything was so segregated. It wasn’t until I saw the Blind Boys of Alabama during the 1980s at the Brooklyn Academy of Music and they were so fantastic I thought that I should make a movie about those guys. Someone was already making a movie so I did decide to broaden the whole thing and that’s what I met Jerry (Zolten) and I was able to interview Ira Tucker of the Dixie Hummingbirds. That’s how it began. I think that the music is authentic. It comes out of something real. There’s a lot of music out there, which is just that just goes through the motions, but this music – I think certainly in the early parts, and I think still, those people who really sing the gospel as it should be sung in my opinion. I mean there’s something real there, and that’s what really distinguishes Gospel. Just like Dennis Edwards of The Temptations said, you know you don’t quite get to the same place when you’re singing rock n roll in his opinion. I’m very happy that I was able to find these people and to get them to speak, tell us their story while they were still alive. I’m so happy that I was able to do that. That for me was one of the most satisfying things. SR: Chime in for us if you will about the connectedness to this music, continuing to capture it and the trajectory of why you’ve dedicated yourself to being able to present this to other people. LH: I always wanted to know: What was going on before Thomas Dorsey? What kind of music? On my program radio program Precious Memories we do music from the 1920s up through the 80s. I try to bring the history and the importance of the music. These are my people. And it is our music, so therefore we brought it here from Africa. And so it is important to share with the listeners the history of this music. It didn’t start with Edwin Hawkins. It didn’t start with Kirk Franklin. It goes back to the 20s and with groups like the Dixie Hummingbirds. They’re all gone now, but the legacy they left behind is in the body of music that we still play. JZ: What Ira Tucker and what Isaac Freeman of the Fairfield Four told me was they called themselves spiritual entertainers. They wanted to entertain and touch you spiritually and they were brilliant at doing that. One of the things Linwood brought up here and for me as well, it’s been a mission of singing the song of unsung heroes and the dimensions to this that we haven’t even touched on yet. Talking about hip-hop for example. We didn’t explore it fully, but the Golden Gate quartet created these songs. With a rhythmic backdrop and no melody over the top, but they were the first singer’s rapping out a story. SR: That that brings me to another aspect of this that I think is really important. There is a phrase about 11 a.m. on Sundays being one of the most segregated hours in the nation. How do we justify both the compulsion for us to claim a higher power and the role that it has in our lives, and still deal with the realities that these groups mentioned in terms of their touring and everything else, but also the living in America of being blind to one another and not being exposed to the true Spirit even in the music because of the racial divide? RC: I think that’s the whole thing about this music. As told in the film, it opened the door. Because suddenly young people especially were saying this is great music. I mean a lot of them probably don’t realize where he came from because it was covered by Elvis Presley and others, but with this film we’re trying to actually educate black audiences – and I think we need to educate the white audience, too. Where did all this music come from and what is the significance? Well the significance is this is what made early Rock and Roll so infectious. Where did it come from? Well of course it came from African-American culture, from way back and developed over the years through these very competitive and wonderful song battles. It became a wonderful art form which I think we all need to appreciate where it came from. Yes, so eleven o’clock. Yes, is true. It’s true. Eleven o’clock, churches still are very segregated, but the music is common to us all. I think that’s what we’re trying to do here. The music goes beyond race because it’s so good. JZ: The film is called “How They Got Over” and it’s not just about how they got over with an audience. It’s about how they got over in life, and how they got over racial divides. How this music reached out and pulled us all in and eliminated you the lines of what religion you belong to, what race you happened to be of, it pulls us all together in an emotional way. That for me is the power of the whole thing. This is the music of transcendence, [and these gospel quartets were brilliant at doing that. They pulled me in just like I said as I was driving home at the crack of dawn when the gospel radio show came on, and it just dragged me right through into the radio speaker. SR: There is history that is also captured in the film about the Northern cities and the larger venues and the struggle of a lot of these groups originating in the deep South and striving to come to a city like Philadelphia in order to play. There’s a difference in reception. There’s a difference in pay. There’s a lot that is invested and involved in gospel being widely accepted and celebrated in some of these spaces. What did it mean for these groups so deeply rooted in a Southern experience to make the transition to a Northern City and especially Philadelphia, and how did that music continue to evolve? RC: It was difficult. The South was where they had their initial audience, maybe at their local church. Then these groups would go out wild-catting. First of all, there was no money, and there was also the oppression. I mean they had their family. They had their friends, but there was the constant problem of not making any money down there. JZ: If you are living in a small southern town, you got to keep moving. You got to travel. You can’t expect an audience for a professional group to keep coming out every week you had to keep on the move. You had a family, but when you were out there touring all the time you were away from your family. It was a real strain on the family relationships. Places like Philadelphia, Chicago, New York – Philadelphia in particular you’ve got a dense population a lot of people packed into a fairly compact area, so you can play fairly frequently close to home. You don’t have to leave the family behind, you know there was tremendous support from Louise Tucker for Ira Tucker when he would go out, but he could come home and be with the family. There was also the reach of radio. Yeah, it was great to be on a radio little tiny station somewhere down south but coming out of Philadelphia, you could be heard all the way up to New York City and Boston and all the way down to Washington and you could easily travel these places. LH: The Dixie Hummingbirds never got the compensation. They got the recognition, but I remember Mr. Davis (James Davis, the founder of the Dixie Hummingbirds) said they rode up to this great big fancy church in a little car, and the Oak Ridge Boys pulled up in the great big bus. SR: Sister Rosetta Tharpe was nominated and will be inducted into the Rock And Roll Hall of Fame in this 2018 class. What do you think made that possible? What conditions allowed for someone like her to emerge? LH: I saw her only a few times when I was very young. Her guitar playing was just spectacular. We were in awe of this lady playing a guitar. She caused hell because she kept going back and forth to singing in the cafes, then she come back to convocation in the church and she asked for forgiveness. Then she would go back on Broadway or in the movies, and she went back and forth. Music is music. Who are we to say you shouldn’t be singing gospel music because you are secular singer? How do you know what that person’s life is like? JZ: As far as recognition for Sister Rosetta, she was unique and outstanding and I don’t know that there is a parallel to her in that genre and she was foundational. RC: It seems to me that she’s a great example of someone where there’s no difference between the two types of music for her. I mean, it’s the same thing. It’s the same feeling, the same spirit in both kinds of music. It might be a little racier in that sense on the R&B side, but still the feeling is the same for me. LH: It’s the lyrics that make the difference. It’s the lyrics that make the difference. JZ: So how does that make it different? LH: Well if you’re singing to the Lord or about the Lord, that’s one thing. If you’re singing about your baby, or your lover, that’s another thing. There’s nothing wrong with it. It’s all about love. If you ain’t never been in love you need to get it in a hurry. This interview was edited for clarity and highlights.